Gassin is located on the Côte d’Azur, between Saint-Raphaël (25 km) and Hyères (40 km). The town is bordering the tourist resorts of La Croix-Valmer, Ramatuelle and Saint-Tropez. The VarLib departmental service (until 1 September 2017) offers regular services to the Gulf (Cavalaire-sur-Mer, Cogolin, La Croix-Valmer, Garde-Freinet, Grimaud, La Môle, Plan- Ramatuelle, Saint-Tropez, Sainte-Maxime), and to the main urban centers of the Var. It is also possible to connect the TGV stations of Arcs / Draguignan, Hyères, Toulon, Saint-Raphaël. The access to the village is possible with the bus 7703 (connection: 7601, 7701, 7801, 7802, 7803). Information and reservations : varlib.fr ; +33 (0)4 94 65 99 92. There is also the line 36 of the Lignes express régionales of the regional council Provence-Alpes-Côte d’Azur. 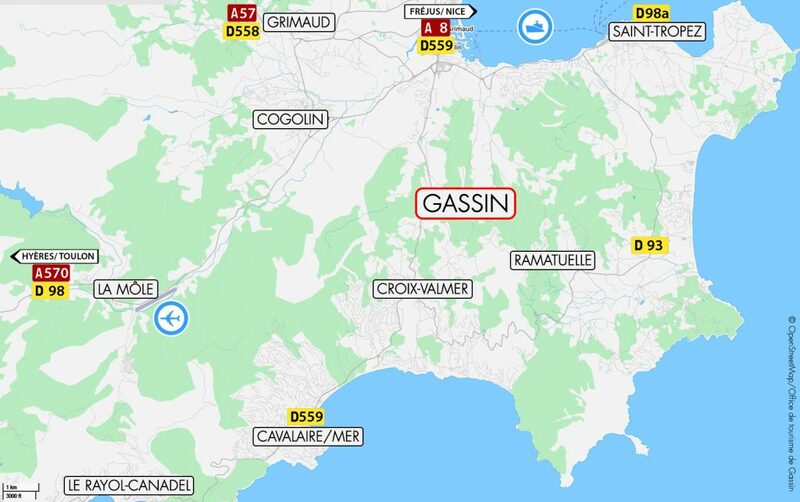 Access in the area of Gassin is possible by train via the TGV stations of Saint-Raphaël-Valescure (25 km), Les Arcs-Draguignan (26 km), Hyères (40 km) and Toulon (55 km). Information and reservations : www.sncf.com ; 36 35. From the A8: exit 36 ​​Le Muy / Sainte Maxime: follow the D 25 until Sainte Maxime, then the D559 (direction Saint-Tropez) until the crossroads of La Foux (Gassin). From the A57: exit 13 Le Cannet des Maures / Le Luc: follow D 558 until the crossroads of Foux (Gassin). From Fréjus / Saint-Raphaël: follow the D8 direction Saint-Maxime then the D559 until the crossroads of La Foux (Gassin) (or the D559 (seaside)). From Bormes-les-Mimosas: follow the D41 then the D98 direction Saint-Tropez until the crossroads of La Foux (Gassin) (or the D559 direction Cavalaire / La Croix-Valmer (seaside). To reach the village, follow the signs “Gassin village / Office of tourism”. New: You can now use the “flexibus”, with 24.99 euros you can go to La Croix Valmer (next commune after Gassin) from the city of Lyon. You can find here the list of Taxis and transfers available in Gassin.